I’m confused. 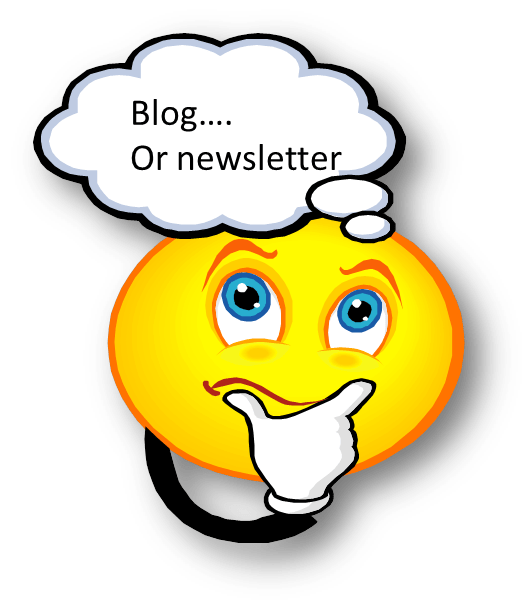 What’s the difference between a blog and my newsletter? This question comes up time and time again with business owners who are just starting out with their online presence. Already stretched for time, producing content for a blog seems like a big task. Newsletters are easier to understand. They are digital versions of paper newsletters that we have all received at one time or another. Although blogs have been around for some time, many business owners still have trouble getting their heads around how and why. This post is about “why”. Search engines like blogs because they like fresh information. When a blog is part of your website, it means your website is regularly updated. Blog posts (think articles) help you focus on specific topics (think keywords) that help people find you. A blog post with great information on one topic is a lot more likely to be found than a homepage loaded with multiple keywords. Blog posts also create a digital footprint and remain on the web as long as your site is still live. Newsletters have a useful life that is limited to what a recipient does with it. Blogs are an opportunity for you to showcase your talents in a less confronting way than an ad. It helps establish your credibility in your area of expertise. And, my personal favourite, blogs are an opportunity for you to be generous and to generate goodwill. Blogs provide information when people are looking for information, whereas a newsletter is pushing information whether the recipient wants it or not, adding to email noise. If your newsletter starts to get annoying, you risk getting tagged as spam. On the other hand, your newsletter arrives in a person’s inbox and prompts them to read your content while left to their own devices, they may forget to read your blog. So the trick is getting the balance right. A good strategy for using the two, is to also include a blurb from a valuable blog post within your newsletter to READ MORE. This way your newsletter readers get to read your blog posts which they may have missed. It also drives traffic to your website! Are you in the 2% of the population that can solve this riddle?